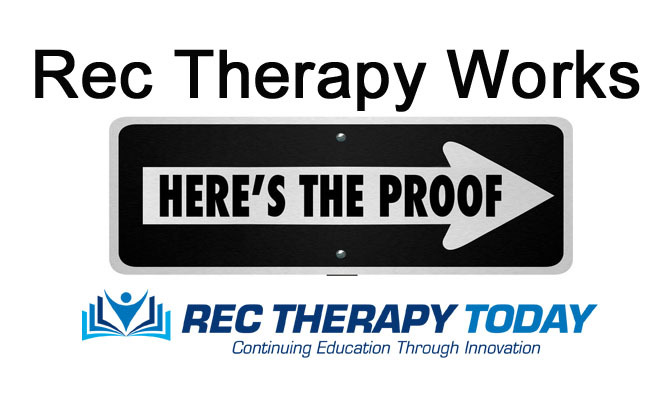 Evidenced based practice is absolutely necessary for the future of recreational therapy. Health care treatment is expensive in the United States. These costs appear to continue to grow. Third party payers don’t want to pay for services for the sake of services. Third party payers want outcomes. They want to know that there is scientific researched evidence that demonstrates the treatment interventions are bringing about specific outcomes. Evidence must be consistent and grounded in research. Services that are not effective at producing outcomes are deemed not necessary and are often cut. In example: providing activities just for the sake of activities is unnecessary and isn’t paid for. Doing activities because it is easy and convenient for the recreational therapist to provide. The one thing to do: Provide research based interventions that are proven to be effective! Ethically it is the right thing to do. We can provide effective services for our patients/ client so they can gain greater outcomes for their health care needs. The good news is that there is tremendous amount of growing research that indicates that outcomes for recreational therapy interventions for specific populations. There are different qualities of research. The lowest value would be expert opinion. In example: if I [Danny Pettry] provided my opinion based on years of practice in a setting with a population. That would be low evidence. If I provided a single study that would be low as well. Meagan is right. You’re busy. When do you find time? Learning about research might seem like a daunting task to take on. Take it step by step. It is all you can do. You can earn continuing education for attending workshops and studying these topics. My best suggestion is: learn everything you can about the population who you’re providing services for, their treatment needs, and study up on treatments supported by research. In example: if you provide services for people with dementia, then consider taking the American Therapeutic Recreation Association’s Dementia Practice Guidelines Training Course. Warning before attempting to do research. There are many legal and ethical issues regarding research. Participants must give consent. Contact a research university prior to attempting to do any research experiments.